Boasting no less than 4 different classic slot game modes to pick from, Magic Wheel 4 Player by Spinmatic also features the rewarding Superbet mode, Magic Wheel with Mystery Prizes, Mystery Multipliers, and progressive Mystery Jackpot of up to €5.000. Find out more in the Magic Wheel 4 Player slot review. A screenshot is worth a thousand words, right? Here you go! 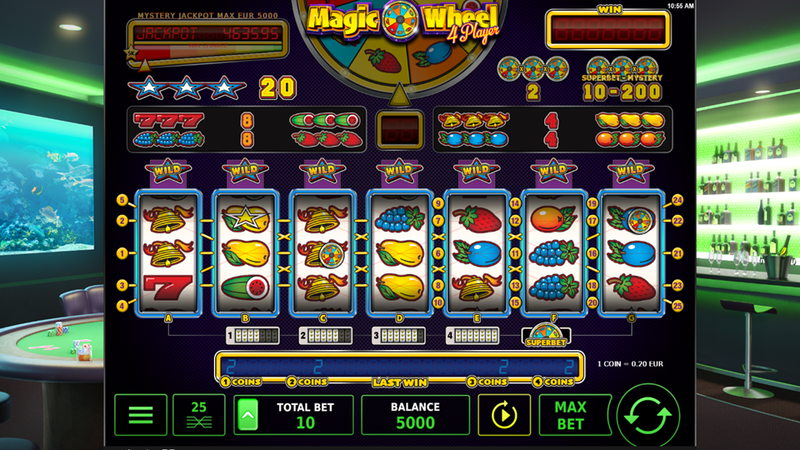 But in the end, you have to try Magic Wheel 4 Player yourself – one of the recommended casino sites should fit perfectly! Stakelogic once again decided to play around with their unique Superbet mode, meaning that some features will be available only to the most ambitious members of our community. Devotees will find the same mechanics, while newbies are just about to realize they will get the Standard Mode with 4 reels, 10 lines and 1-coin minimum bet along with the Game 2 as a 5-reeler with 15 paylines and 2 coins minimum. Game 3 combines 6 reels, 20 betways, and 3 coins. Also, Game 4 will feature 7 reels, 25 lines, and 4 coins, while the most challenging Superbet Game 5 will come with the minimum bet of 8 coins you will place across 7 reels and 25 paylines. The same set of rules work no matter if you play for fun or for real money. The only difference is that the Magic Wheel 4 Player Free Play grants demo credits instead of cash prizes but makes a great way for newbies to learn how to win and make no investment in front. Star works pretty much as the Wild allowing you to combine it with other Stars, as well as with Fruits and Bells to receive a special Star Prize. Also, you can use it to complete the payline. At any random occasion, you can trigger the Mystery Jackpot worth a minimum €500 and a maximum €5.000. A few tips for your better experience: try to keep your betting level at the highest rating since it increases chances for winning the Magic Wheel 4 Player Bonus prize. With the coin value ranging from €0.01 to €1, you can set up your own betting strategy and wager between €0.40 and €500 per round. Remember those values may vary depending on how many betting options are active. When 3 Magic Wheel Symbols appear anywhere on the reels working as Scatters, lucky winners will seize the Mystery Win Prize enhanced with a Mystery Multiplier. We talk about 500 coins for 3 Mystery Fruits and 25.000 to 50.000 coins in the Superbet mode. This should compensate for the absence of classic Magic Wheel 4 Player Free Spins. You can play online on the Spinmatic -powered sites without a need to download the iPhone app or the Android .apk file. 3. What is the RTP factor of Magic Wheel 4 Player? The official info sources state the RTP stands at 95.00%. Our Magic Wheel 4 Player tutorial proved this figure to be correct. A true classic with challenging gameplay and the progressive jackpot will surely attract high rollers, but we can’t think of any reason why newbies shouldn’t try the game after reading the Magic Wheel 4 Player recension. Just remember to be patient and persistent enough, since it's very difficult to win this game.